As the venerable weekly newspaper ceases print publication, let us hope that its brilliantly belligerent journalistic legacy lives on. For decades, The Village Voice was a Manhattan-based weekly newspaper with national reach and an outsized influence on American journalism. Tuesday’s announcement that it would cease print publication inspired “End of an Era” headlines across the country. 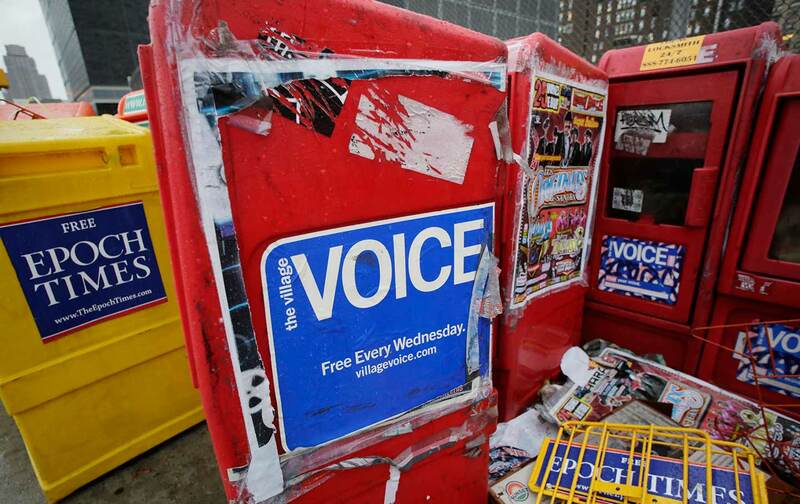 As a longtime reader I am of, course, sad that the Voice will no longer be a part of the still-vibrant print culture of New York City. I know that the paper retains at least some potential to shape the politics and the culture of its hometown, if sufficient resources are committed to maintaining an ongoing digital Voice. But there are no guarantees in these transitions, so the sense of loss, even mourning, in many of the reports on this change for the Voice is understandable. Whatever comes next, however, the Voice’s place in the history of modern journalism is secure. Long before anyone used the term “alt-right” or “alt-left,” there was the “alt-weekly.” Alternative weekly newspapers were—and in many cases still are—essential journalistic voices in communities across the country. And The Village Voice defined the genre as one that reconnected journalism to the fights that mattered in the great cities of the country. Established daily newspapers became increasingly obsessed with wealthy suburbs in the 1950s, ’60s and ’70s, as advertisers began catering to the demands of wealthy suburbanites. As this happened, once-great daily papers disengaged from the gritty political battles that still played out in urban neighborhoods. A new breed of “alternative” weeklies filled the void. They modeled themselves on the Voice because the New York paper had shown what was possible—politically, culturally, and journalistically. By treating local electoral fights as epic conflicts between good and evil, and by writing about them with an enthusiasm that made those fights as interesting and significant as statewide and national contests, the Voice refocused the politics of New York City in the late 1950s and early ’60s. It broke open avenues for reformers and made possible a new urban politics that was fresher, bolder, more diverse, and more adventurous. It is fair to say that this remarkable weekly newspaper, which was ready to pick fights rather than merely cover them, cleared the way for the breakthrough elections of mayors as distinct as John Lindsay and Bill de Blasio, and for local contenders—Bella Abzug, Shirley Chisholm, Elizabeth Holtzman, Carol Bellamy, Mark Green, Ted Weiss, Jerry Nadler—who became national and international figures. As alt-weeklies came into their own in the 1970s, evolving from their underground roots into vital voices from Boston to San Francisco, the model established by the Voice was essential. The New York weekly had proven a decade earlier that a smart, serious weekly could occupy the ground that daily newspapers and radio and television news operations abandoned when they made the mistake of focusing on lowest-common-denominator “regional coverage” and began to pretend that weather reports were news. The Voice distinguished itself by challenging economic elites, especially the real-estate developers who were making New York City less affordable and more unequal. Wayne Barrett’s brilliant reporting for the Voice was decades ahead of its time—especially his late-1970s pieces focusing on how a young Donald Trump was having his way with the city. If everyone had read Barrett—and if every journalist covering the 2016 campaign had reread Barrett—Trump would never have become president. What was notable about Barrett’s coverage of Trump was that it extended from the reporter’s intensive coverage of local politics and local government. The Voice kept its sharpest eye on the political players—especially the Tammany Hall Democrats—who were busy bartering off the city to the highest bidders. The paper upset many of their best-laid plans. The Voice won its greatest battles at the grassroots level, taking on the bosses in Greenwich Village at a time when the bohemian enclave was still ruled by machine Democrats. The paper battled for years to displace Carmine DeSapio, the Democratic district leader for lower Greenwich Village who in the late 1940s became the boss of a resurgent Tammany Hall. It was a brutal battle, in which the reform movement that the Voice endorsed suffered a number of setbacks before it prevailed in the early 1960s. So central was this struggle to clean up the politics of Greenwich Village—and by extension the politics of New York City, the state of New York, and the nation—that when the still young Village Voice received a 1958 First Prize for General Excellence from the statewide New York Press Association, publisher Edwin Fancher devoted his acceptance speech to a recounting of the fight against DeSapio and the machine. “We started with the idea of publishing a vital paper devoted to significant local news, plus coverage of cultural and artistic events so characteristic of our area, and columns and cartoons of a high level. We had few partisan political prejudices. Indeed we knew that we had a lot to learn about politics and were prepared to take our time in learning it,” Fancher told the assembled editors and publishers. Our new venture met with immediate favorable response from the residents of the community in terms of circulation—now 11,500 paid, largest community weekly in Manhattan—and in advertising, from most of the small shopkeepers. But from the beginning we were aware of an undertow of resentment from certain political elements in the community who showed consternation over the emergence of a new independent voice. Virtually from the outset they were battering at our doors and clamoring over our phones in an attempt to twist us to partisanship in their favor, while at the same time we discovered an active, if underground, campaign to discredit our paper and undermine our local advertising. Over the years since 1955 our refusal to play the role of house organ to the vested political interests of Greenwich Village has grown more and more intolerable to them. And if we were innocent when we started, it was there gentlemen who sent us to school—educated us, but not quite free of charge. We began to learn the facts of life, and we began to become politically oriented. Indeed, we have just urged the defeat of Mr. DeSapio in the next primary election by an independent candidate as yet unchosen. We who have lived with Mr. DeSapio and his organization are forced to wonder what he regards as the trust and responsibility that the press has forgotten. Whatever he means, it is hard for us to believe he means a truly independent press. After DeSapio was finally defeated (by a young Ed Koch), the Voice went from strength to strength—not just in New York City but as a model for independent journalism that was intellectually honest, respectful of the intelligence of its readers and conscious that local fights, grassroots fights, could change everything. As we struggle today with a president who has even less respect for a truly independent press than did Carmine DeSapio, that model remains a vital one. Yes, Donald Trump poses a threat that is national in character and global in scope. But he started local, as have so many of the crises facing our nation. No matter what form independent and courageous journalism takes, be it print or broadcast or digital, we need it now more than ever. We need it in Washington, to be sure. But we need it, as well, in every village—rural or urban—of the republic that will not survive without a free press that is bold enough to expose and challenge the political and economic elites who so frequently abuse their positions.